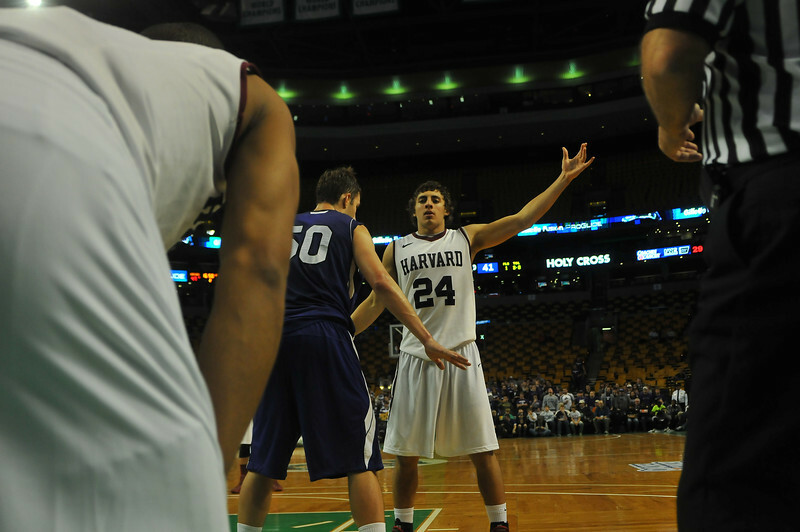 Sophomore forward Jonah Travis opened Harvard's 2013-2014 season with 20 points and 10 rebounds at TD Garden in an 82-72 win over Holy Cross. On the very first game of the season, it was clear that Jonah Travis was ready to make an impact on the Harvard men’s basketball team’s run at an Ivy League championship and March Madness bid. The junior forward opened the 2013-2014 campaign with a double-double, notching 20 points and 10 rebounds in just 22 minutes off the bench in an 82-72 win over Holy Cross. Averaging 13.2 minutes per game, Travis has been a key cog in the Crimson’s rotation this season. The third-year player has established a presence in the paint, averaging a rebound every four minutes with gritty determination—a characteristic that caused his secondary school coach, Dave Thorson of DeLaSalle High School in Minneapolis, Minn., to take notice early. The government concentrator has been as effective on the offensive glass as he has been on the defensive glass. This season, Travis has picked up 46 boards off opponents’ attempts and 46 boards off Harvard attempts. His presence as an offensive rebounder has helped the Crimson extend possessions and pick up crucial points. Thorson attributed Travis’s past and recent success to the junior’s consistent drive to improve. Despite often playing power forward or even center for the Crimson, Travis stands at only 6’6”. In order to be effective at the Division I level, he had to develop his game to be able to compete with taller, more athletic players. Travis’s junior year has not been without some difficulty. Halfway through the season, the 6’6” forward suffered a concussion that sidelined him for two games in late January and early February. The Minnesota native returned in a limited capacity on Feb. 7 in a win against Brown, recording only three minutes. Travis did not play double-digit minutes until Feb. 21 against Penn. But in the last four games of the season, he averaged 16 minutes in winning efforts. The junior has also seen a reduced role in the Crimson’s starting rotation this year In order to work returning senior forward Kyle Casey back into the lineup. As a sophomore, Travis started 14 games on the year, but he has primarily come off of the bench this season. Despite his decreased time on the floor, his presence in the paint could make a difference when 12th-seeded Harvard faces fifth seed Cincinnati in Spokane, Wash., on Thursday in the second round of the NCAA Tournament. Travis’s tenaciousness as a player runs in the family. His little brother, Reid, followed in the footsteps of his older brother as a standout at DeLaSalle. Now a high school senior, Reid Travis received offers from Gonzaga, Stanford, and Duke, ultimately opting to play for the Cardinals in Palo Alto. The 6’8” power forward is ESPN’s 25th-ranked recruit for the class of 2014. The hard work ethic does not stop once Travis leaves the basketball court. The junior spent his summer interning at the asset management firm Wellington Management located in Boston. He also traveled to India with the Crossover Basketball and Scholars Academy to tutor underprivileged children in academics and teach them basketball. —Staff writer Kurt T. Bullard can be reached at kurtbullard@college.harvard.edu.